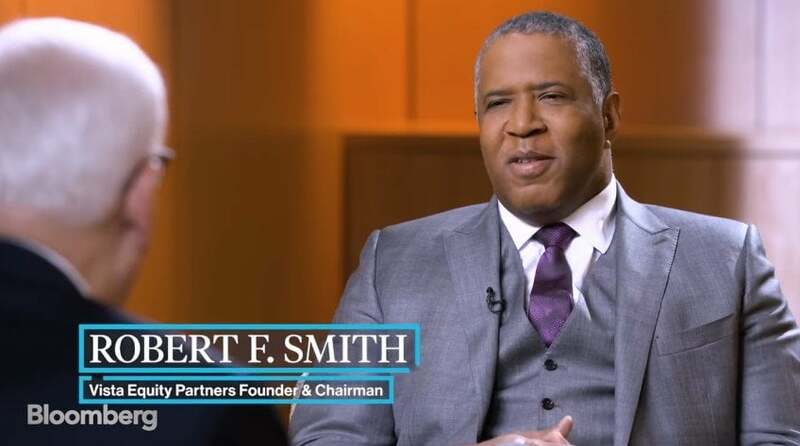 An interview with Private Equity titan, entrepreneur and founder of Vista Equity Partners, Robert F. Smith. In this interview, Robert discusses his life and career in engineering and finance. Robert also talks about what makes his investment strategy different and philanthropy. I was basically raised in a family of I'll call it achievers. And my mother and my father both had doctoral degrees in education and they emphasize not only to my brother and I but to the rest of the family the importance of really you know a becoming educated be working really hard and you know trying to become the pinnacle of success in one's community. And you know when I look back at those days and the the formative elements of who we were in our communities I saw parents who gave generously of time energy effort and intellectual capacity to our to our community. And I think that led me to do was always think about striving for excellence. Talk about your background in a moment but I'd like to now just explain to people what you actually did that made this great fortune. What we did and what I was able to do was was Bridge a couple of ideas you know software is truly still the most productive tool introduced in our business economy over the last 50 years and through my work. When I was early as an investment banker I got to see a number of software companies and how they operated and I ran across one that turned out to be a client and ultimately the owner of that business that that trust ended up being my first investor. And that particular business had a set of practices that they use business practices that help them run that business more efficiently than any other software company that I had seen. And so in essence you know what I would say you know took some of the kernels of those best practices and said if you took them and as an engineer and create a process around delivering those best practices across the world of enterprise software you could do quite well when you grew up in Denver. There are a lot of discrimination against African-Americans. I grew up at a time when desegregation was just starting. And so prior to that like all cities in America and large cities there are segregated communities and there still are for the most part. And it's unfortunate. I grew up in a predominantly African-American community. We all lived in that community for the most part because you still had redlining you still had an accessibility to capital to buy homes which created in essence the basis of a lot of the wealth in America. So it was a time in growing up that I really understood the importance of community and it was pretty much a segregated community. I grew up in until we started busing and forced busing created the desegregation leasing the school systems. When you were very young your mother brought you to the march in Washington D.C. to where Martin Luther King made his famous speech. I think the impact of her bringing me and my brother here not only was you know for the summer but for us to understand that our community stood for something our community was striving for something and it was important that we were a part of it. And I think that's part of the lifelong you know part of my soul which is I have to give back and help my community move forward in this wonderful country called America. Now as we have this discussion now where in the African-American history and culture museum to which you one of the largest donors this is very near where Martin Luther King gave a speech.